"...You can always do a little bit of Kusadasi sightseeing later on in the afternoon once you’re back from Ephesus shore excursions and done with your Kusadasi shopping too." Whenever you ask anyone about seeing Kusadasi tourist attractions, they will automatically refer you to visit the Ephesus ruins which are a mere 20-30 minute ride away from Kusadasi harbour. However, you can always do a little bit of Kusadasi sightseeing later on in the afternoon once you’re back from Ephesus shore excursions and done with your Kusadasi shopping too. Although the town itself really does not have any grandiose historical attractions, we’ll still point out a few spots to look out for when walking around town and doing your shopping. The first one to catch your attention will be the Caravanserail, a fortress-like structure, only about a 100m walk up from the exit of Kusadasi harbour. Feel free to enter this structure and look around. Built in 1618, Caravanserail used to be a resting and trading stop for caravans. It was built thanks to Okuz Mehmet Pasa, grand vizier to sultans Ahmet I and Osman II, together with the Kaleici Camii mosque, the Hammams and the city walls. Today, the building has been converted into a hotel and a Turkish carpet centre. If you happen to have an overnight in Kusadasi, you can attend the Turkish night show with belly dancing. 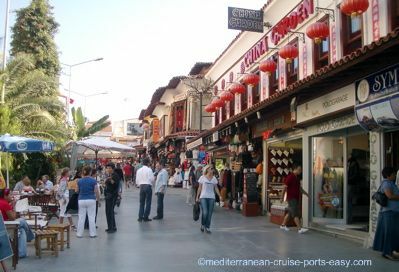 Right “next door” to Caravanserail, more precisely, to its right when facing the entrance, are the Oriental Bazaar and Grand Bazaar. This is a semi-open market place with hundreds of little shops selling Turkish rugs, jewellery, leather, clothing, knock-off bags, ceramics and pashminas. This can really be a high-pressure zone so load up with lots of patience and tranquillity as you’re being called to enter the stores from many sides all at once. A great place to practice your haggling techniques! 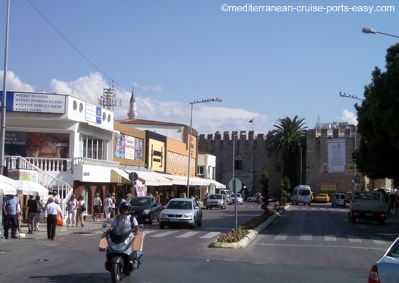 The wide pedestrian only street running up from the water front along the Caravanserail is called Barbaros Bulvari. Walking down this street with the water behind your back, on your left will be the Kale district which features many traditional houses and narrow streets which can give you a feel of what the town used to be like in the past. This is a good place to look for some traditional Turkish food venues. Walking around Barbaros Bulvari and the Kale district it is very likely you will at one point hear the ezan (the call to prayer) from one of the neighbouring Kusadasi mosques. Follow the minarets to visit one of them. To visit a mosque, make sure your knees and shoulders are covered and remove your shoes before entering. The ladies will also be given a headscarf. The Pigeon Island is the small island that Kusadasi got its name from. You will see this symbol of Kusadasi on your right hand side as your Mediterranean cruise ship sails into Kusadasi harbour in the morning. At first it was called the Bird island as it was frequented by birds during the seasons migrations. Today, the island is connected to the land via a causeway. In the 13th Ct the island had an important military and strategic role as it protected the mainland from pirate attacks. There is a Byzantine castle on the rocks of the island, as well as a few restaurants and cafes to relax in. 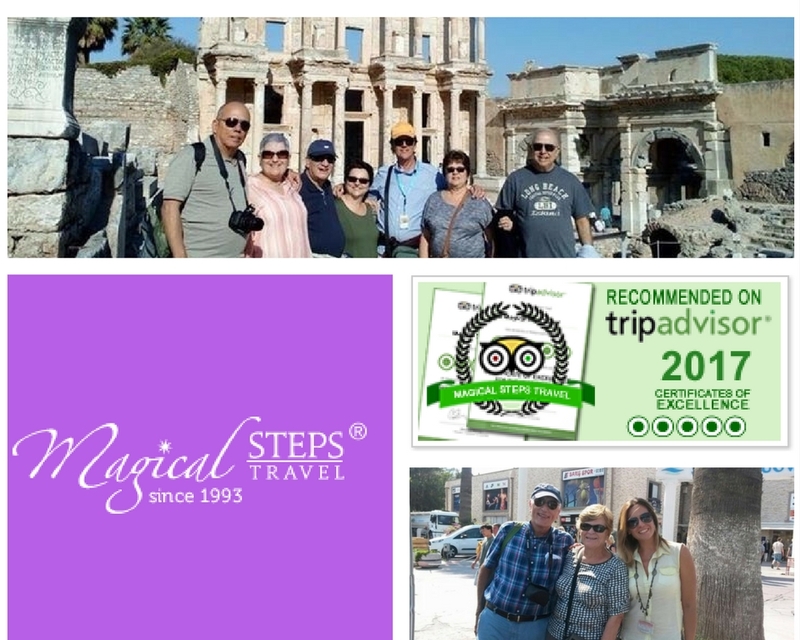 Looking for a good private tour agency for your Ephesus tour in the morning? Check Magical Steps Travel.